Aspire Spryte Coils work perfectly with the titular Aspire Spryte AIO Kit, offering silky cloud production and immaculate flavor. The 1.2ohm resistance is optimized for nicotine salt juices and any vaper who prefers a mouth-to-lung style of vaping. Also available are higher 1.6ohm resistance coils. The Aspire Spryte AIO kit is a compact, portable tank-style pod system that is compatible with standard vape juices, as well as nicotine salt juices. The Aspire Spryte's ergonomic design makes it the perfect fit for your hand and its all-in-one construction make it as easy to use as a pod device with the customizability of a larger mod kit. Refilling the Aspire Spryte pod couldn't be easier; simply remove the silicon anti-leak plug located on the bottom of the pod, fill up with your favorite vape juice, and replace the plug. 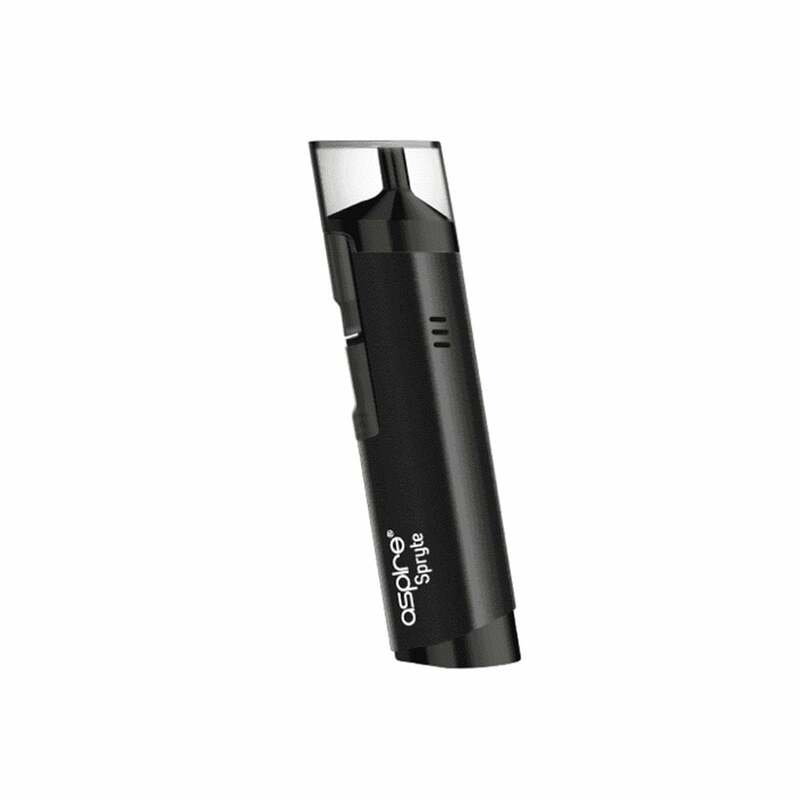 The Aspire Spryte is capable of using Aspire BVC coils as well as the Aspire Spryte Nicotine Salt BVC coils that are optimized for nicotine salt juices. To replace coils, remove the chimney piece from the Spryte pod, unscrew the old coil, screw in the new coil, and you're good to go. The Aspire Spryte's chimney piece also allows you to adjust the air-flow to your preference. The Aspire Spryte's built-in 650mAh battery is great for vapers who are on-the-go and don't want to worry about running out of charge. Though the battery holds a substantial amount of charge, Aspire have managed to make it the perfect size to fit in any bag or purse, making the Spryte AIO kit a favorite among busy, everyday vapers. If you like the option to choose between nicotine salts and standard vape juice, but also enjoy a discreet, travel-sized vaping device, the Aspire Spryte is a must get. Note: It is recommended, upon installing a new coil, to allow juice to prime the coil for 10 minutes before using to avoid burning the coil. This is really good, it gives a little bit stronger hit than I like but it works for when you only have time for a couple of puffs because it seems pretty strong. It's cute and comfortable in the hand. Didn't work. No vape. Returned and deemed defective. Bummer. Haven't had a cigarette in a week and 2 days after I started using this. That means I saved around 90 dollars that would have been spent on cigarettes. This little machine literally pays for itself in a few days. Battery life is pretty good. I usually charge it once a day. The cable it came with is to short to use it while charging but I have a longer micro USB cable that I use. I really like the valve that constricts the intake. I feel like I can get a good MTL draw. I would recommend this if you are trying to quit smoking. The Spryte is awesome and love the color and was surprised that the liquid that came with it was also good. It was spearmint was not sure how that was going to be but ended up being very good. I will definitely buy again. I absolutely LOVE my Aspire Spryte. I'm fairly new to vaping after a failed attempt to quit cigs with mods a few years ago. Things I didn't like about mods were addressed with low watt MTL devices like the Spryte and this one was recommended to me at my local shop. I love how simple it is to use and it's super affordable. I appreciate the LED battery indicators and the on/off switch so it doesn't go off in your pocket. Great tank capacity, coils are easy to find and inexpensive (8-10$ for 5) and with pretty heavy usage they last me around 2 weeks. Fast USB charging, adjustable airflow. The minor things I don't like are the impractical slanted bottom, which make it difficult to stand up and don't really add to the aesthetic. The dust cap doesn't snap into place securely, so it falls off easily and it can leak a tiny bit if turns upside down in my pocket. I also get slight flooding during refills, but I've learned to block it by cramming tissue into the mouthpiece, filling at a tilt, then blowing into it a few times to remove any excess and it does great. I do have battery issues though; a full charge only takes maybe 15-25 min but is completely dead within an hour or two even with turning off between use. This is probably a defect so I'm contacting the company re warranty. I've tried multiple open pod systems for nic salts and while this isn't the smallest for concealment, it's one of the best. Holds a decent amount of juice and has a good battery. Neither will last all day but it will last most of the day. I own two of these are they are consistent and very lightweight being all plastic. I love this little Spryte. It fits very comfortably in my hand, I actually like it more than my Breeze 2. The only thing about the Spryte is for whatever reason the designers created a slanted base so it’s impossible to stand it upright, so your only option is to lay it on its side. The only complaint I have about the Spryte is the coils don’t last nearly as long as my coils did on my Aspire Breeze 2. I might get 4-5 days out of the coil on the Spryte compared to about 2-3 weeks per coil on the Breeze 2. I use nic salts from the Naked 100 line, so they are on the sweet side, but no sweeter than the nic salts I had used in my Breeze 2. But the coils aren’t very expensive for the Spryte so it’s not something that would make me stop using it. I prefer it over my Breeze 2 because it’s a smoother vape, fits more comfortably in my hand, and it is a thicker vapor cloud than the Breeze 2, although I’m not really a cloud chaser. I have not had any problems with leakage from the Spryte. The only problem I have encountered is sometimes when I’m filling the pod the eliquid doesn’t want to go in the pod but acts as if the port hole is clogged even though I don’t see anything clogging the hole, so the liquid wastes around the hole rather than going in. I think the hole has an angle to it and I’m just hitting it at the wrong angle because if I adjust the tip on the bottle it goes in. However those nic salts are pricey so I hate wasting any at all. Overall, I’m extremely satisfied with the Spryte and would definitely recommend this.